Imagine substantially increasing the success of your incentive program while also halving your overall costs. Sounds too good to be true – right? It’s now been proven that you can! Over the last 21 years, we have executed numerous incentive programs that have included a strategic alliance between two clients and gained a substantial increase in the number of achieving customers while their fixed cost component decreased. A strategic alliance is an agreement between two or more non-competing businesses who sell in the same channel while still remaining independent organisations. In the past, we have successfully partnered bread and milk companies, pie and sauce companies and a host of others, in fact, any two or more non-competing companies who share the same customers. A strategic alliance is an agreement between two or more non-competing businesses who sell in the same channel while still remaining independent organisations. For incentive programs, an alliance is beneficial for those businesses who want to increase their sales while halving the up-front costs across one or more non-competing companies. As part of the alliance, the set-up, launch and program management costs, as well as the costs associated with development, execution and platform are evenly divided between the businesses involved – saving marketing costs across the board. While the strategic alliance is cost saving for businesses, it’s also beneficial for their customers as it can make it easier for them to achieve the aspirational reward at the end. This is because their former single target is now split across the businesses and a customer can opt to achieve one large target with one company or split the target and achieve across the two companies. By allowing your customers to have an increase in earning capacity, the overall program has a greater relevance for them, resulting in an increase in engagement. This is important because the greater the number of customers who are engaged with the program, the greater the sales and incremental margin the businesses will generate during the buying period. For example, an incentive program that involved one of our clients saw their sales grow by 25 per cent year-on-year, though only 30 customers achieved the end reward. The next year, the client formed a strategic alliance with a non-competing business that shared the same customers to boost the overall success of their incentive program. Following the conclusion of the strategic alliance incentive program, client one’s sales grew by 28 per cent year-on-year and received a 275 per cent improvement in reward achievement, with 112 customers achieving level one of the tiered reward. The increase in achievement meant that 34 per cent of the combined buying power of the participating industry attended the rewarded event, providing a great opportunity for the businesses to network with their key customers. Along with an increase in engagement, our original client reduced their fixed costs by 40.6 per cent due to the alliance with client two. While a strategic alliance incentive program is beneficial for reducing costs and increasing sales engagement, it also connects the sales teams from each of the businesses. The hunting as a pack concept allows sales teams from aligned companies to join forces and form a team to work together to encourage customers to engage, buy and achieve as part of the program. This is beneficial for the businesses as it creates a sense of importance to the customers who are now contacted by two sales teams instead of one, with a common growth goal. When recruiting for a strategic alliance for an incentive program there are many things to consider. Share the vision to build a strong partnership. They should also have an innovative approach to sales growth and marketing. During another strategic alliance incentive program, one of our clients achieved a 142.5 per cent improvement in the number of customers who achieved and were rewarded. They also reduced their costs by 44.2 per cent after forming the union. This alliance was formed with a business that shared the same customer-base and had a complementary range of products, allowing the customer’s targets to be reduced to gain greater sales. 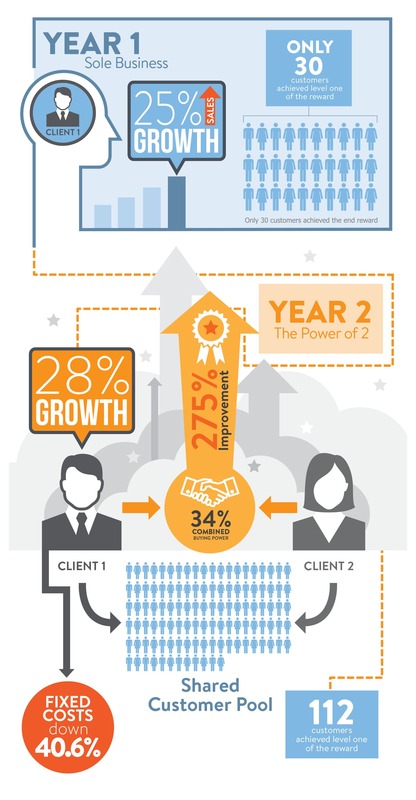 The power of 2 is a proven and genuine win, win for you and your customers. The overall strategy engages and rewards more customers while the partnered businesses achieve a greater incremental margin. And while the incentive program is self-funding and directly measurable, a strategic alliance divides the overall costs across all businesses, providing an enhanced R.O.I on the program. If you have a business within your industry you would like to form a strategic alliance with for your next incentive program, give us a call and we will work to bring you together to generate great results. Fill out the form below and let’s talk about your next Incentive strategy.